Photograph of Bharot's house in Patan, showing elaborate wood carving on the upper storey. Wood carving was very popular in Gujarat to decorate the houses' facades. 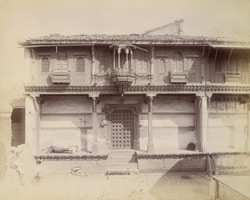 The photograph gives a head-on view of the façade of the haveli described by Cousens as one of the houses of '...the late Bharot Kahanji Umadsinghji in Khada Khotadi's Mahalla'.